This is a different kind of post for Wintersong; you just never know what you’re going to get when you pop in here. I was just thinking, now that we’ve got a guest coming for New Year’s, that with both Thanksgiving and Christmas fast approaching, many of us will find ourselves hosting overnight guests. 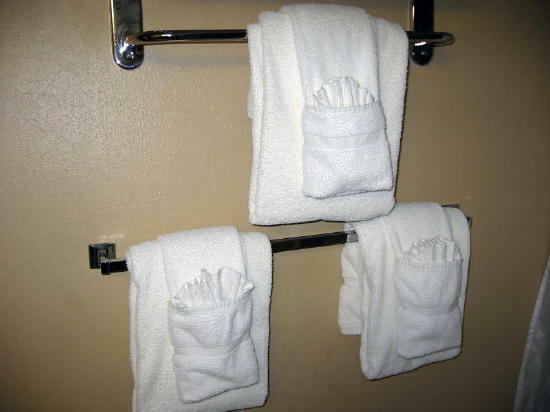 Here’s an easy way to fix up the guest bathroom with that extra little detail to your guest towels to make your guests feel pampered and welcome. It’s not a new idea by any means, but one I recently rediscovered during hotel stays on our recent road trip to the Florida Keys. Naturally I took a few digital photos to share on Wintersong since I’m really into photo journaling my life. You’ll need a large bath towel folded the usual way. Then you’ll layer these, the prettified part, over the top of those hanging on the towel bar. For the second layer, take a face towel, lay it out on a flat surface like this (top photo). Pleat-fold the wash cloth, fold it in half and lay it at about this angle on top of the face towel. Then, fold up the bottom as in the next picture. 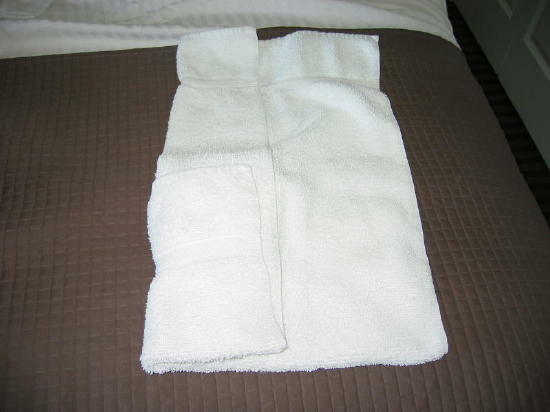 Now these are ordinary, cheap Best Western type of towels, and your own guest towels will no doubt be much more impressive and prettier. What amused me was the sign on the one bathroom counter (since all our hotels were really into this type of guest towel display) that announced something to the effect that the hotel is happy to learn that their towels and linens have proved so popular among their hotel guests that they now are able to offer them for a small charge. These were about $8 for the large, $4 for the small, etc. And blankets were $24! Don’t remember what the linens went for, but the list went on with items such as the iron and ironing board, shower curtain and so on. What a creative way to say to people that if you steal, we’ll tack these charges onto your bill! My question is, what kind of people who can afford to stay at a hotel wouldn’t be able to buy all these items themselves without resorting to stealing?! Now, back to business of folding guest towels. Now that you’ve gotten this far, carefully flip the towel over like the photo on the left, face side down, and fold the sides in by thirds. See how easy it is? In the end this is what you should wind up with. Remember, it’s gonna look much more beautiful with your Egyptian or Turkish cotton towels. But the real trick of overnight guests, as everyone must know already, is making everyone feel welcome, but not so welcome they decide to move in. I don’t think these prettified towels are apt to that, honest I don’t. Happy holidays! And thanks to the Best Western Hotel in Ft. Myers, Florida for inadvertently providing me with this idea and the photos (which I took myself), without charging me a cent above the usual room rate. This entry was posted in Families, International Travel, musing, Musings, Personal by Alice. Bookmark the permalink. Cute and practical!!!!!! A winning combo!!!!! I’m glad you liked it. I was afraid someone would be tempted to say “how proletarian!” But I really liked them. Doesn’t take a whole heck of a lot to impress me. You sure have creative ideas to share with us… pictures and scribe! I too noticed similar “warnings” in all Malaysian hotels with tagging in the list of hotel items… otherwise, the were forced to replenish regularly. How funny! I did the very exact same thing! Took the pictures and everything! I haven’t tried it yet but I did buy some really nice towels to use the next time I have company! Are we alike or what? Cute. But I am afraid the Grandkids will have to use paper towels. Darn me. I have guest towels that I have had for years. I don’t have many overnight guests so they are still good as new. I do love fluffy thick bath towels. 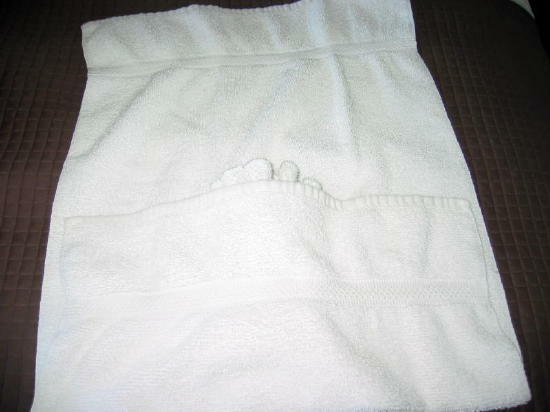 Even though I live alone, I have always folded my towels this way — even the wash cloths. I try to be a perfectionist and usually fail miserably. royaltlady, I appreciate your confidence! And note that I finally got my butterfly fixed in my sidebar. Many thanks! GrandmaHenke, we do seem sometimes to be cut from the same kind of cloth, although you’re probably a much nicer grandma than me, and lots funnier, too! Mage, you do what you have to do. Paper towels work for me and you don’t have to wash and fold them. 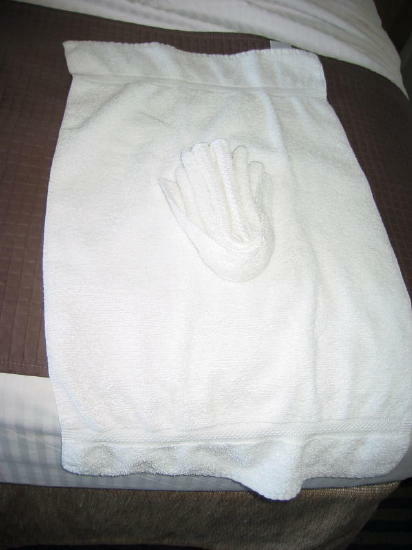 Darlene, I use the same towels as my guests do, because I decided long ago that I deserved the nice towels too. So I got rid of most of the cheap stuff I’d been using and replaced them with the fluffy thick ones you speak of. I do carefully told them in thirds and take great pride in stacking them neatly in the linen closet, but I usually don’t do the frilly thing. I do appreciate little niceties by others though. Thanks to all for visiting. Oooh, it’s snowing on your blog! Those are some really unique ways of folding towels. Personally, they almost remind me of either a form of Japanese or eastern art. Well done!